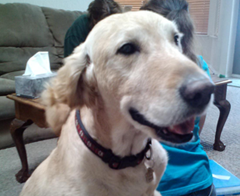 On June 23, 2013, Patty Walters said goodbye to her beloved Golden Retriever, Nelson, who was suffering from cancer that had spread throughout his body. Nelson was only 8 years old and his passing left a huge hole in Patty’s heart and also in the life of his sweet Golden Retriever companion, Emma. “Nelson was originally found at a shelter in El Paso by the Golden Retriever Rescue of El Paso (GRREP) and placed in a Las Cruces home. 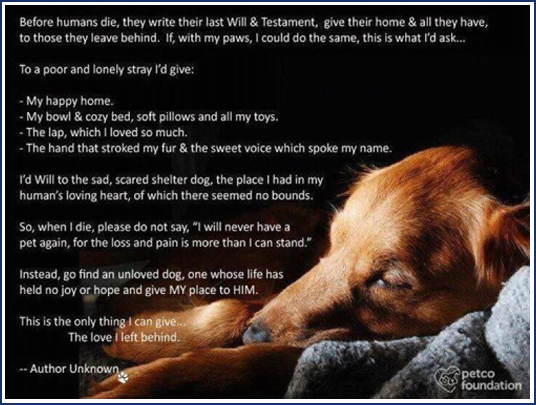 It ended up being a bad situation for him, and he was at the Animal Haven here in Las Cruces when I went to see him and ultimately adopted him. They thought he was around 6 at that time and I had him for a (too short) 2 yrs., so he was around 8 when he passed. He was (and Emma still is) in an organization called Therapaws. It’s a national organization that certifies dogs to go into nursing homes, hospitals & schools (to name a few) to basically just visit with people and brighten their days. Nelson was the best at it! When Nelson passed, the head of GRREP, Connie Jimenez, sent me a condolence email and the stray poem [see below]. There really isn’t a separate Golden Retriever Rescue in Las Cruces, folks here just work in adjunct with the one in El Paso. Cassie was a stray in Deming who was picked up by someone there, and that person turned her over to GRREP after unsuccessfully looking for her owner. I became her “foster parent” about three weeks ago, a situation that didn’t last long because I adopted her a week later. I guess you have already figured out that I am a soft touch!